Framed by a blooming dogwood tree, historical markers list the names of some of the Confederate dead buried in a mass grave at the Chattanooga Confederate Cemetery. Chattanooga Mayor Andy Berke apparently thought his fellow city chief executive had the right idea Friday when he issued a news release that said he was asking his city attorney to file paperwork to ensure the city was no longer associated with the Confederate Cemetery on Third Street. The gesture followed a week of politicians across the South expressing new-found opinions that any or all statuary in their states or cities that in any way memorialized the Confederate side of the Civil War more than 150 years ago be moved, destroyed or covered. Since Chattanooga has no public Confederate statuary to besmirch — save a bust on the Hamilton County Courthouse grounds that was erected in memory of a former soldier who helped in the peacemaking effort to preserve Chickamauga Battlefield — Berke must have felt duty-bound to join his fellow politicians and make a stand against the violence that broke out in Charlottesville, Va., on Aug. 12, when protesters clashed over the potential removal of a statue there of Confederate Gen. Robert E. Lee. In this case, it was an unnecessary stand and a particularly empty gesture. And just for good measure, his statement was released on a Friday, the day all smart politicians make statements or release unpleasant news in the hopes it will become buried in the weekend milieu. Since the Charlottesville violence, no cry had been raised about the Chattanooga Confederate Cemetery. No noise had been made that the graves were offensive. No one had suggested the dead be unearthed and moved out of the city. The number of University of Tennessee at Chattanooga students who park along the cemetery on East Fifth Street who even know who is buried there can probably be counted on two hands. Berke's release said the city is not even on the deed for the land. But the mayor's statement said he requested City Attorney Wade Hinton confirm the city is no longer listed as a trustee for the property. The city, according to Civil War expert Anthony Hodges in a 2013 Times Free Press article, "took over the cemetery in the mid-1940s" (in 1942, in a Chancery Court order, as one of multiple trustees) with the passing of the last area veterans of the war. It's unclear for how long the city cared for the cemetery or what it did to help maintain the final resting place of, at the cemetery's completion, 749 known persons and 156 unknown. In 1990, according to Hodges, the cemetery — where at least two Union soldiers, one black soldier and one female nurse are among those interred — was cleaned with the assistance of descendants of Confederate soldiers, and a refurbished memorial gate was rededicated in 1995. 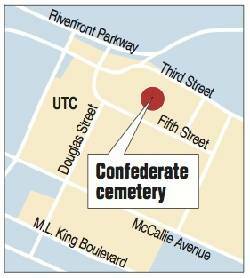 Today, according to Hinton, the city allows the Sons of Confederate Veterans to make repairs and tend to the cemetery. Why the fuss, then? If a veterans group maintains the cemetery, who cares whether the city owns the property, is on the deed for it, or is a trustee? If this were a burning issue, why didn't Berke make taking the city's name off any cemetery paperwork one of his campaign promises when he first ran for mayor in 2013? Or when he ran for re-election earlier this spring? We all get it, though. It wasn't an issue until other Southern politicians seeking to rid themselves of the stain of guilt over the slavery that was one of the causes of the Civil War made similar gestures last week. "Confederates fought against America to preserve slavery," the mayor's statement said. "That is the truth, and we should no longer subsidize any myths to the contrary." The statement also said the city condemned "white supremacy in every way, shape and form" as if Chattanooga had been a recently divided hotbed between a majority who wanted to foment a race war — perhaps starting with a march from the Confederate Cemetery and a ceremonial cross-burning — and those few, valiant souls who wanted peace. We, in fact, were a divided region before the Civil War, not a bastion of Southern sympathy like many other cities in the South. The late Chattanoogan Dr. David McCallie, who edited a 2011 book on his grandfather's local remembrances of that era, said his family's split, with sympathizers on both sides, was typical. "These divided family sympathies were not unusual in East Tennessee," he wrote. "The town of Chattanooga voted to join the Confederacy, but rural Hamilton County voted to stay in the Union." When the war was over, and survivors found their Confederate relatives buried in a "low unsightly spot" on the banks of the Tennessee River, they did what any decent Chattanoogans would do then or now — find a better solution. That's how the Confederate Cemetery, adjacent to Citizens Cemetery and Mizpah Cemetery, came to be. When the bones of a Civil War soldier were buried in the Confederate Cemetery in 2001, having been unearthed during the excavation of a home on Missionary Ridge, no determination could be made whether the soldier served on the side of the Union or the Confederacy. Nevertheless, he was given a funeral withfull military honors. "This was somebody's son," said Frank Harned of the local chapter of the Sons of Union Veterans of the Civil War. "At one time, somebody prayed for this man's return home. He never made it, though. Now we're trying to answer some of those prayers from 135 years ago." To go through a legal process to make sure the city's name is no longer listed as a trustee for the cemetery to score political points seems to us the most grandiloquent gestures of any we've heard since Charlottesville.